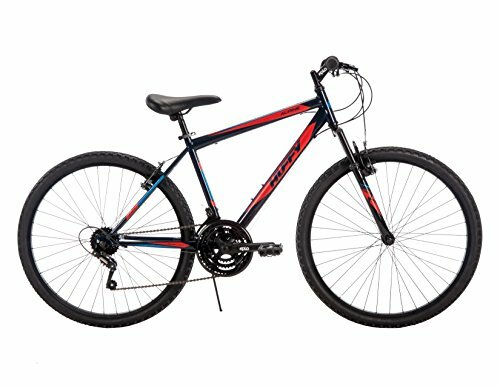 This 26" alpine bike is gloss midnight blue with Huffy branded krayton grips. It has a precision crafted steel hard tail frame and a kolo 1200 suspension for mountain-sized fun. The brakes are steel linear pull and there is 18-speed twist shifting. The tires ae 26" x 1.95" knobby with weather resistant lightweight alloy rims for improved performance. Easy-to-use twist shifting comes with 18 speeds and the rear indexed derailleur for consistent, smooth gear changes. Front and rear steel linear pull brakes provide sure stopping action. The 26" knobby tires provide a rugged footprint, an excellent tread for dirt and paved surfaces. The 3-piece Kolo steel crank is strong and reliable, while lightweight alloy rims are weather-resistant for improved performance.